We spend way too much time agonizing over our early-round draft selections. The fact is, nearly everyone in your league will have similar rankings at the top end of the draft. And sure, you can say “I’m going to avoid Chris Johnson at all costs,” but at the end of the day, what really differentiates your team from another is how you do in the late-rounds of your draft. There’s little room for error when you’re selecting in the first round. I mean, when you get LeSean McCoy with the third overall pick, you can’t expect him to do much better than finishing in that position. And moreover, McCoy better finish as a top back, because if he doesn’t, your team could be in for a world of hurt. That’s why we focus on early-round draft analysis. We could think of the early-round choices as the core of our teams – players that shouldn’t ruin our chances at fantasy greatness – and the late-round picks as players that have an opportunity to become part of that core. There’s no reason to draft Davone Bess in Round 13 because his upside at becoming a third round-esque player is minimal. But a player like Kyle Rudolph? Well, his upside creates a lot of value in the late rounds of drafts. We can pinpoint someone like Adrain Peterson or Marshawn Lynch and think that getting an early to middle-round rookie running back will yield fantasy success. In reality, late-round rookie backs have recently been more productive. Look at Steve Slaton, Chris Johnson, LeGarrette Blount, DeMarco Murray and Roy Helu. Load up on some late-round rookie running backs if you have a deep bench. It’s worth a shot. This season especially, get your starting tight end towards the end of the draft. Not only is the position deep with a lot of upside players, but did you know that, outside of Gronkowski and Graham in 2011, the difference between the 3rd best tight end to the 10th tight end was just over 20 points? Not worth it. Moreover, when you start just one tight end in your lineup, there are more in free agency. Because of this, and the fact that there is little variability between tight ends, it’s not worth getting a backup tight end – even if you’re taking a risk with your starter (from the point above). For instance, if you get Lance Kendricks and he doesn’t pan out, then just play the wire for tight ends throughout the season. The position is one of the more overrated ones in fantasy football. The more ambiguity a player has in the late-rounds of drafts, the better. Why? Because ambiguity equals risk. And high risk typically yields a high reward in the fantasy world. If you feel confident about a player, but you know the rest of the league is against him, then you’re in perfect shape for a solid late-round selection. On the flip side to the point above, you don’t want to draft a player in Round 12 that has little upside. Recent examples: Davone Bess and Kevin Walter. You know what you’re going to get from both of these players. And you know, that for the majority of the season, they’ll be sitting on your bench. Think of this rule as “don’t draft someone that you could get out of free agency.” As I’ve noted before, you want a 12th round pick that gives you potential 4th round numbers. Is Davone Bess really going to do that in a non-PPR format? If I didn’t throw this one in there, I’d get a lot of raised eyebrows. Now, we all know why I feel this way. I’m not saying you should wait until round 11 or 12, but if you’re following my strategy, definitely do not draft your quarterback early. Read my book (please) if you’re unaware of what this strategy entails. This is the same logic as drafting backup tight ends. When you’ve got just one quarterback starting on each team in standard leagues, there will always be someone startable in a given week in free agency. Now, if you have a deeper bench, I can’t blame you for having a backup quarterback. Definitely get one before a backup tight end, too. But don’t select one over valuable running backs and receivers. Remember, every round in a fantasy draft is important. Don’t just go quarterback because you understand the position more. Again, if your bench is deep, it’s a great idea to load up on backup running backs who have injury-prone or risky players in front of them. The fact is, it’s rare to find running backs finishing all 16 games in a season. Get a player like Mike Goodson, who’s backing up the always-hurt Darren McFadden. Not only can you benefit from it, but the guy who drafted McFadden will surely want the handcuff. Kickers are statistically insignificant. It’s not worth drafting them before the last round. Period. With more offenses moving to 4 and 5 wide receiver sets, we’re seeing 2nd and 3rd wide receivers becoming more relevant to fantasy. If you see one of these players in pass-first offenses with elite quarterbacks (like Randall Cobb) fall to the late-rounds of your draft, getting one is worth the pick. It’s not worth getting a defense before a running back or receiver. The better strategy with defenses is to pick one that has a solid Week 1 matchup, and play the wire from there on out. Defenses, like many NFL teams, are just too unpredictable at the beginning of a season. And even if you know a team like the 49ers or Steelers will have great defenses, the difference between them and other top-half ranked ones is minimal from a fantasy points perspective. Clearly these rules will slightly change with different league types and scoring. 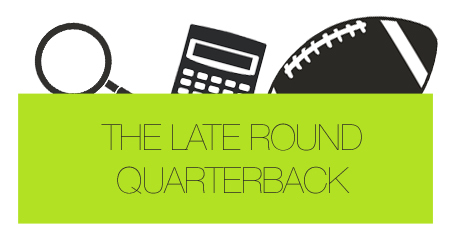 But for a broad, general stance on the late-rounds of your draft, these guidelines can help. It’s important to always build wide receiver and running back depth, and at the same time, allow other teams reach for defenses and kickers. The tail ends of drafts are truly where champions are made in fantasy football.